When fans think of Batman, they imagine more Gotham villains and less samurai warlords. However, fans will be able to combine the DC hero with Japanese history when a new suit of samurai armor goes on sale. 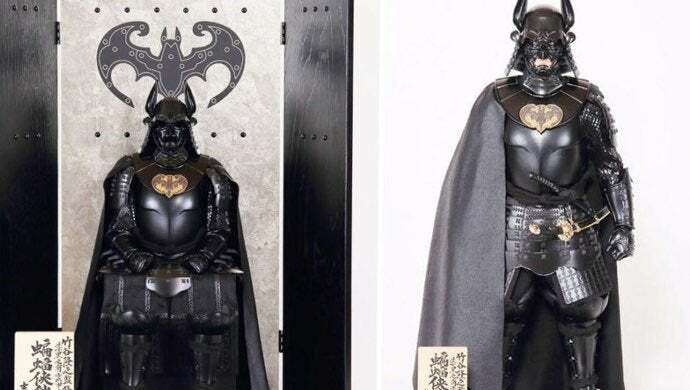 As reported by Japaaan, Warner Bros. Consumer Products has teamed up with Japanese company to release actual Batman samurai armor. However, fans better keep from picking a fight with the hopes of this suit saving them. The armor isn’t all that functional, but it will be a must-have for collectors. The armor will be released to honor Children’s Day in Japan. The holiday, which takes place on May 5, is celebrated with parents putting up miniature armor suits to celebrate their sons. The tradition is done in the hopes the boys will grow up strong, and this Batman suit might just ensure the sons are nerdy to boot. Yoshitoku will release the DC-inspired suit soon, making it one of several recent pop culture miniatures to be released. In the past, Mickey Mouse and Star Wars have gotten samurai suits, but Batman is the first DC hero to get the treatment. The tallest suit of armor will stand at about 29 inches while the second falls a bit shorter. The sets will retail for the same price and put parents back a whopping $2,700 USD, so they better be sure this suit of armor suits their kids before cashing out. Designed by Takayuki Takeya, the artist hoped to make Batman feel “pre-eminent” with this figure. The miniature can stand or sit depending on its positioning, and both models are expected to sell quickly. Pre-orders will be accepted starting on March 1 before the figures ship out in May. "Batman Ninja takes a journey across the ages as Gorilla Grodd's time displacement machine transports many of Batman's worst enemies to feudal Japan - along with the Dark Knight and a few of his allies. The villains take over the forms of the feudal lords that rule the divided land, with the Joker taking the lead among the warring factions. As his traditional high-tech weaponry is exhausted almost immediately, Batman must rely on his intellect and his allies - including Catwoman and the extended Bat-family - to restore order to the land, and return to present-day Gotham City." So, would you shell out for this suit of armor? Let me know in the comments or hit me up on Twitter @MeganPetersCB to talk all things comics and anime!